For Christmas my other half gave me the gift of beer. More specifically, the gift of supplies to make a beer I'd been dying to try but that sold out pretty much as soon as it hit the shelf. 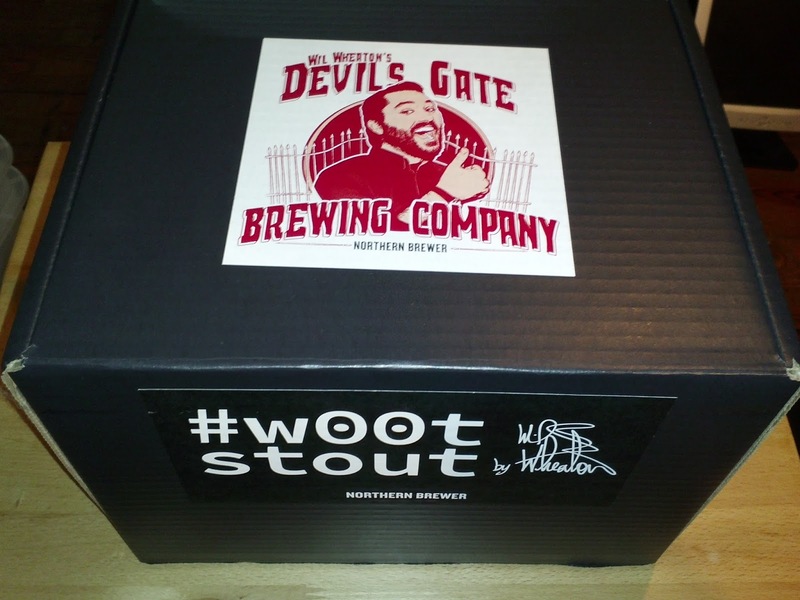 One part über boozy, three parts über geek, this one-of-a-kind imperial stout from masterminds Wil Wheaton, Greg Koch (Stone Brewing) and Drew Curtis (founder, Fark.com) has been likened to drinking the booze-soaked contents of an old-fashioned candy store. 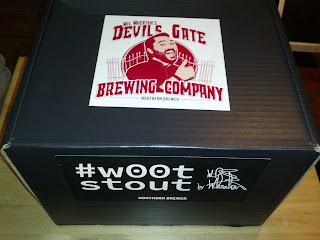 Deep and complex, w00tstout pours pitch black with a clingy cappuccino head erupting in an oaky, nutty bouquet of caramel and vanilla, roasty dark malt and a hint of bourbon. I don't know about you, but that sounds amazing to me. Downside to all of this is that my kitchen is an exceptional mess due to going through boxes of my mom's stuff. Also, working four part-time/temp jobs plays havoc on my interest and ability to clean house. January was a pretty crazy month. But, we did happen to have one hell of a snow day on February 2nd (actually, it was the first many snowdays that month). Not only that, but when I went out to shovel one of the other tenants said they were about to snow-blow everything! So with minor shoveling (still had to take care of the porch and around my car) finished up, and a little more time spent containing the disaster zone of my kitchen, it was brewing time. 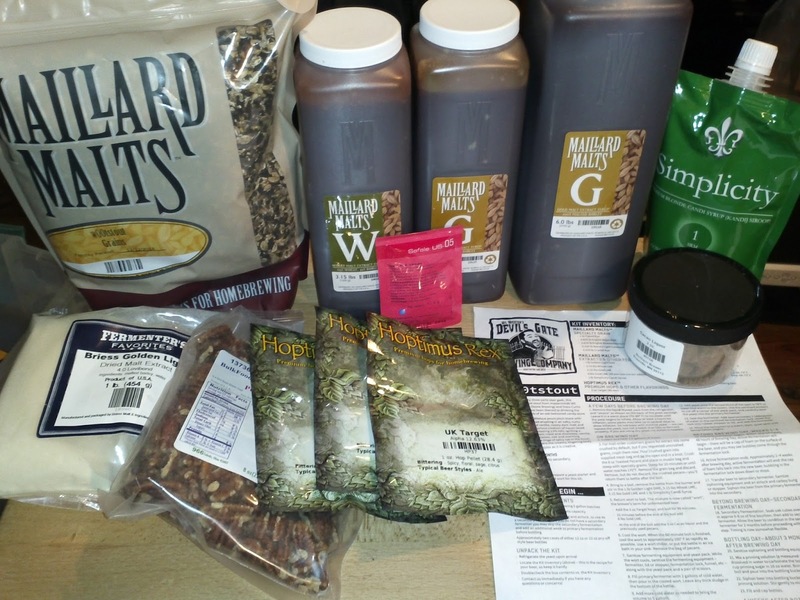 Brewing itself isn't horribly complicated. At the most basic it's not much different from making tea with a few additional steps. 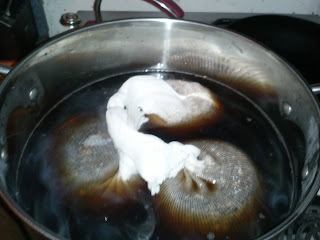 Boil water, add sack(s) of ingredients, let steep, cool, add yeast, ignore for a few weeks or more. 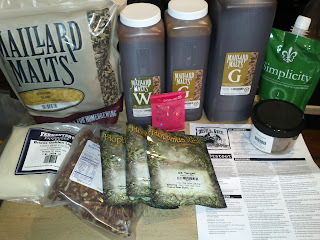 Due to time, space, and equipment I'm using extract kits, not full grain, so that simplifies things. The massive amount of snow was also great since once the boil's finished the next step is to cool several gallons of liquid as fast as possible. 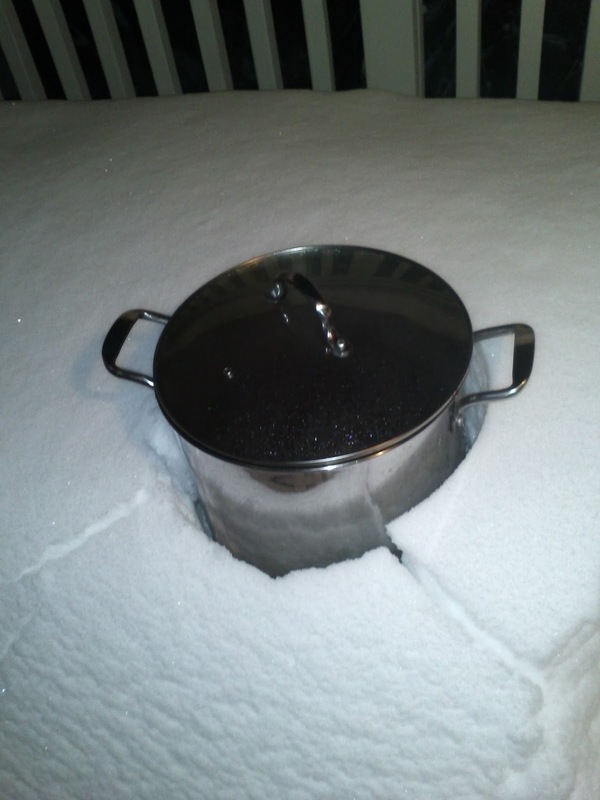 Yes, snow also has insulating properties, but it's still cold, I can keep moving snow in around the pot as it melts, and it's less wasteful than a cold water bath with constantly running water. 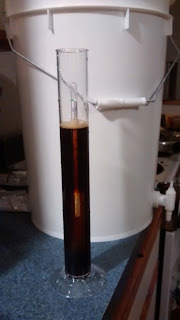 This wort had a lot of sugars in it, so I definitely worried about explosive fermentation. I am happy to now report that there were no tragic brew explosions in my closet. This is not a beer for the impatient. One month in the primary fermenter, two months in the secondary fermenter, and then a month to condition. We got a preview of what's to come during bottling, sampling some of the flat beer. And man, we could taste the bad news bears in this beer. 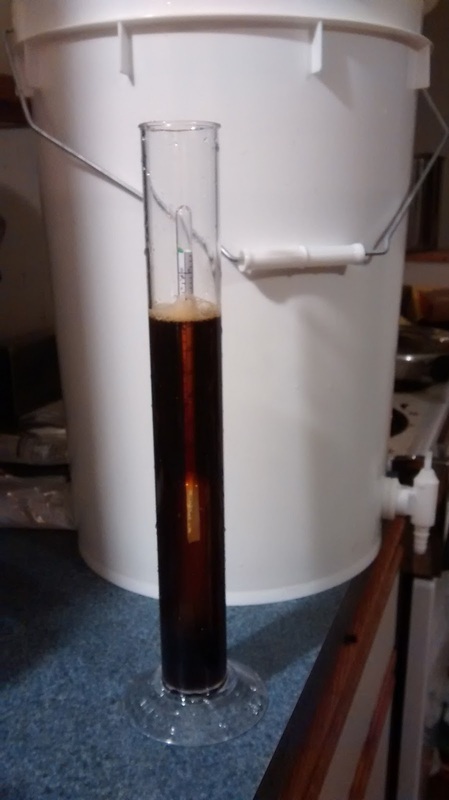 It clocked in at around 11% ABV... and then we added more sugar for carbonation. This bad boy is dark, complex, and dangerous. So after all that waiting I finally get to try my creation. Holy crap. This beer. I'm pretty sure that it's over the target 13% ABV now, but the bad news bears have gone stealthly. The first bottle opened had a surprising amount of sediment, but that that may be due to it being one of the last bottles filled. The flavor, however, is out of this world. The harshness of the bourbon smoothed out into a highlight in this dark, smooth, malty flavor. This is a sipping beer, you want to savor it and enjoy the aroma. Drinking faster than that will hit you like a truck. Actually drinking a pint slowly hits me like a truck. A fantastic sharing beer, splitting the pint with friends. Definitely a beer worth waiting for.